Baum-Kuchen: 06:10:12 [147/365] - special stories from the weekend market! 06:10:12 [147/365] - special stories from the weekend market! I hope you had a nice weekend! I am glad that I was able to get through two markets. Though it is really a hard work to make these pop-up shop happen, it is so delightful to meet my customers in person and hear their stories about how they would use their Baum-Kuchen items. Alex who was my booth neighbor at the Rose Bowl Flea Market (yeah... he and his friend were the one who were selling the vinyl record and DVDs next to our booth in the below photo. They kept our booth very happy with some fun music!) got his first set of Traveler's Notebook to write journal letters to his 3-year-old son... EVERYDAY. He really liked that he could use the Archive Binder to keep all the journals in one place... so his son can someday read what it was like to be his papa. These are few of the stories I heard from yesterday and today... and they make my passion grow even more to curate a very special shop that is unique, warm and one of a kind. Thank you everyone for taking part of the Baum-Kuchen journey... 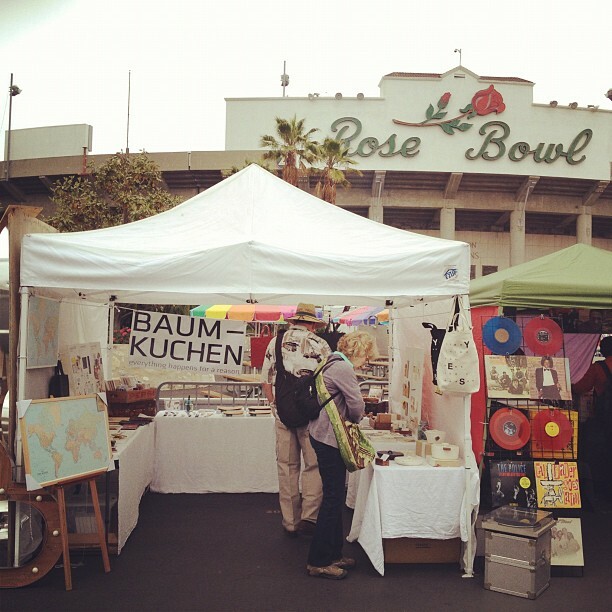 I am really looking forward to going back to the Rose Bowl Flea Market next month!